The Amsterdam Brewing Co. Limited has been a customer of R.E. Morrison Equipment Inc. for over 12 years. Amsterdam purchased an original airknife drying system to dry beer bottles at their King street location. 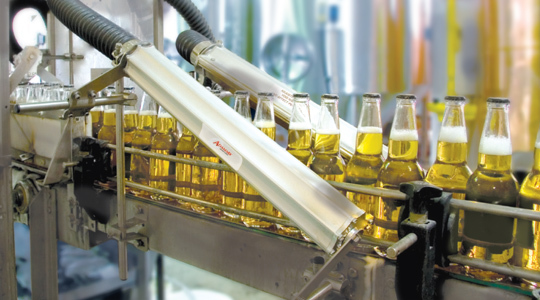 The requirement was to dry clear bottles at up to 40 BPM. At that time, clear bottles were new to the industry, and to make them spectacular the labels had to be sharp and crisp on the clean shiny bottle. In 2006, the remarkable success of the Amsterdam product created a need to expand. Amsterdam moved to a new brewery at 21 Bathurst street in downtown Toronto. Along with the move came new equipment and a faster line speed of 60 BPM. Their plan was to grow the original drying system with production. Over the years R.E. Morrison Equipment added a new 5 hp Republic Regenerative blower to the drying solution to improve efficiency over the original 3hp system. Even with this upgrade, Mr. Jason Britton of Amsterdam found the original system couldn’t dry the bottles at the increased line speed of the new facility. The product had lost the clean, shining look that had made them so recognizable to customers. The labels required excessive glue to stick and at times even slid on the wet surface of the bottle. The primary cause of the wet bottles was condensation; lots of condensation. Mr. Britton came to R.E. Morrison for a solution. The Adamark Air Knife Drying Systems Engineers at REM recognized from past success the limitations of the regenerative blower and could not expand the system using the old blower. Though very cost effective when used at low pressures, the key problem with regenerative style blowers is poor volumetric efficiency at higher pressures. When the system demands a pressure of 60 “H2O to create the air velocity necessary to dry the bottles, the volume of usable air was less than half of the open flow rated volume. Furthermore, the problem of increased condensation could only be solved by increasing the heat of the air at the airknife exit. The regenerative blower simply could not handle the task. Adamark Air Knife Drying Systems use the Republic made compact centrifugal blowers in all large drying systems, with line speeds up to 650BPM. Recently, Republic completed manufacturing of a smaller centrifugal blower perfectly suited for a small brewery with line speeds up to 100 BPM. Amsterdam Brewery agreed to the plan to add the new Republic HB500 7.5 hp blower to deliver more air flow and temperature to the existing air knife system. The Adamark install team completed the upgrade in one day leaving a system that delivered clean, dry, condensation free bottles to the labeller and ink jet coder. Mr. Britton reported a reduction of 2 buckets of glue in a normal production run, with a clean and dry finished product. Condensation always returns to the bottle, but the Adamark system removed all residual water and prevented condensation from returning long enough to accurately label and code the bottle. The cardboard case no longer has water marks or damage, caused in the past by excess water. Mr Britton and Amsterdam Brewey are pleased with the addition of a new blower to upgrade an old airknife system. New Adamark Air Knife Drying Systems are designed to be scalable, with the ability to grow as your production increases.